Jean Eustache Stoute: Patizan-Mwen I Las; Ay Sí Ay No ; Ay Sí Ay No ; Maypole Interview. Matthew Thomas & Kalenda Band: Regimen Mwen de Leon Mama; Sewe Wangala; Fire Brigade Water the Road; Israel on the Road, He Coming; Matthew Thomas & J D Elder: Kalenda Interview ; Kalenda Interview . Vasco de Freitas & Tamboo Bamboo Band: Congo Bara; Fire Brigade Water the Road; Vasco de Freitas: Rollo the Ganja; Vasco de Freitas & Alan Lomax, J D Elder: Midnight Robber. Alfred Codallo’s Orchestra: Castilian; Ram Goat Baptism. Sotario Gomez Orchestra: Pasillo; Maysotis . Alan Lomax & Cocorite Band: Hosein Description, St. James ; Alan Lomax: Hosein Description, St. James . Cocorite Band: Hosein Drums, St. James. Rawlingson Hector: Sergeant, Give Me the Day Today; Rawlingson Hector: Call Ellen For Me. Pedro Segundo Dolaballie & Group: Maysotis . Growling Tiger, Lord Iere, & Indian Prince: War. Mickey Bentic & Group: We Yo Ka Monte, Sewei. As John Cowley points out in the extensive accompanying booklet, the spring of 1962 was a good time to be recording folk music in Trinidad, for independence was coming later that year, and there was consequently a mood of celebration, and enthusiasm for the local cultures whose musical aspects Alan Lomax was intending to document. The assistance of Dr J D Elder, from Tobago, was invaluable, for Elder had been documenting Trinidadian folklore since the early fifties, and his knowledge of the local music, and where the best musicians were to be found, made the month of fieldwork productive, wide-ranging, and of very high quality. 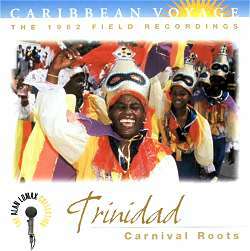 Cowley implies that the selection on this superb disc, which is designed to illustrate the traditions that contributed to the development of the Trinidad carnival, still leaves out a good deal of material, and it can only be hoped that more recordings from this instalment of Lomax’s Caribbean trip will eventually appear. Anyone with an interest in Trinidadian music is surely going to buy this CD, so I don’t propose either to summarise the notes’ discussion of Carnival, or to describe the subtle and ingenious way in which the running order interweaves different aspects of the music of the island. (I will, however, applaud Rounder for including the thing whose absence I so often lament–a map of the recording locations.) Rather, I want to stress the way that the music on the disc illustrates the sheer richness and diversity of Trinidadian culture, which has taken in and synthesised linguistic, religious and musical elements from Spain, France, Britain, India and, of course, Africa. The resultant creole cultures (not a single culture, given the way that different elements predominate from place to place and at different times) were not created without tensions, variously between colonial rulers and local people, between capital and labour (not necessarily synonymous with the foregoing), and between Trinidadians of different races. Most cultural activities by Trinidadians of Indian and African ancestry do not overlap; Lomax was fortunate to find an exception in St. James, Port-of-Spain, where there was some Afro-Trinidadian participation in the Muslim festival of Muharram (called Hosein in Trinidad). The Cocorite Band - two bass drums, two kettle drums and a cymbal - included an Afro-Trinidadian, playing a drum called ‘Old Queenie’ which, as Lomax observes, ‘probably [gives the band] its hot lick.’ (sound clip) Incidentally, Lomax manages to drop a startling brick when interviewing the musicians, by asking, "Everybody in the band is a Hindu, are they?" This at a festival commemorating the martyrdom of the Prophet’s grandsons! The Cocorite Band is one of several percussion ensembles featured; most extensively heard is the kalenda band led by the old stick fighter and chantwell Matthew Thomas; the band’s four barrel drums, and call-and-response vocals, are powerful and obvious evidence of the African descent of the stick-fighting songs (although I was intrigued to read, in J D Elder’s short history of calypso, included in the booklet, that the rural stick fighting tournaments were ‘organised by the Portuguese shopkeepers and publicans.’) The second of Elder’s interviews with Thomas gives some startling insights into the violence, and the deviant status, of the stick-fighters’ lives. Prison and early death were expected fates in the old days, and the blood hole, which Thomas is clearly reluctant to talk about, was used for the collective draining of wounds, in a ritual of blood brotherhood. JDE: What kind of damage stick men could make? MT: Well, when you get cut…you have to go there in the blood hole and drain the blood. And, finally, the English language, fashioned into a weapon of satire, insult, philosophy and sexual bravado by Trinidadians of African descent - mostly; Indian Prince, who appears on War, is one of a handful of East Indian calypsonians. War is actually a surprising disappointment, despite the presence alongside the Prince and Lord Iere of the great Growling Tiger; all three of them seem verbally rather uninspired, and unable to decide whether to exchange insults, or to sing about the undesirability of the atomic bomb. Better is Rawlingson Hector’s Call Ellen for Me, sung in both English and Creole French, although I’m not sure why the notes call it ‘spirited’, since it’s one of the most mournful minor key kaisos I’ve ever heard. with your dunce head I will have some fun. and you will be numbered among the dead. At the age of one I started to see misery, that is when my mother was robbed from me. At the age of two, I started to rob men, women and children too. At the age of three, my […] was all free. At the age of four, I entered into Lucifer’s door. At the age of five, I started to rob babes from their mother arms and bury them alive. At the age of six, I entered into the Bank of Monte Carlo. At the age of seven, I made plan to destroy Earth and Heaven. At the age of eight, my record were all straight. At the age of nine, I entered into the worlds of crimes. At the age of ten, I entered into the House of Parliament. that is when she heard of my miraculous conduct. and gain my battle in bullion. That was the greatest rumour in manhunt history. Fourteen thousand dollars were given for my capture dead or alive. Ten thousand policemen died, nine thousand was injured. for they know what lionhearted, cruel-minded, cold-blooded criminal I am. I visited the house of death, but now I am standing here quite cool and calm. But do you know what my intention is to do? Use my revolver or dagger on you. The idea of a robber speech was to make people hand over their money. I hope that this review achieves the same end.